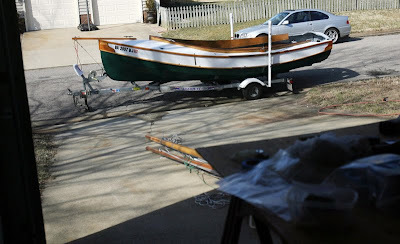 It didn't make it into the 50's today but it was warm enough to roll the boat out of the garage and get another coat of varnish on the rub rails, tiller, boomkin and centerboard cap. Tomorrow it should be warmer and I hope to get some touch-up paint on the hull and deck. It got colder in the late afternoon so I rolled Spartina back into the garage and brought the smaller pieces inside to dry in the warm house. By tomorrow the boat should be ready to sail (but as Spring goes on I'll add a few more coats of varnish). We just need a little warm weather. I did get a solid vote from Bruce for using Dixon Creek as our anchorage on the first night out. 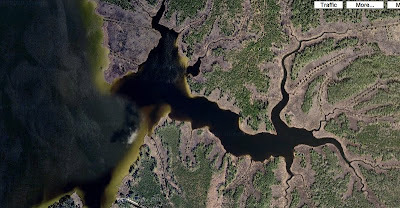 That is the creek below, just off of Goose Creek leading to the ICW south of the Pamlico River. As Bruce pointed out, we got there late in the day on our last trip, worn out for a long day of beating into the wind and the waves. Here's our post from that visit. Why not visit Dixon Creek again, relax and enjoy it. Sounds good to me. After all these years Mom is still showing me the way to go. I received a nice birthday gift from her that she suggested I spend on cruising gear. 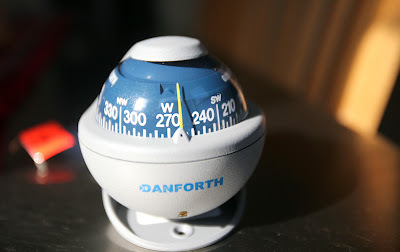 So I took her up on it and got this nice Danforth compass for Spartina. In the past we've always relied on our gps's and a handheld compass for navigation. It will be nice to have a permanently mounted, easy to read compass mounted is easy sight on the centerboard trunk case. The compass came at an excellent price as a close-out item. So there was enough left over for a a nice leatherman pocket knife and a Kuhn Rikon paring knife for the cook kit. 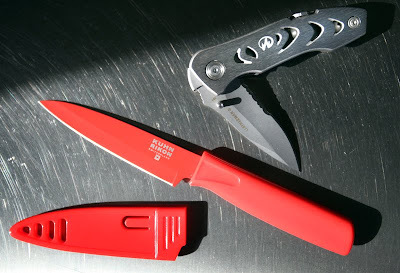 The pocket knife will replace the old one that fell apart on the Crab House cruise. 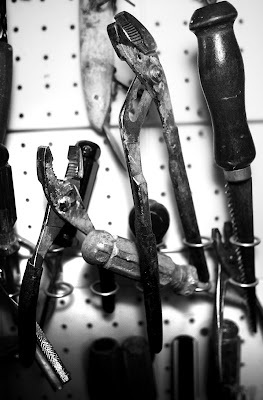 It will supplement the Gerber multi-tool that I carry in the day storage box, something I got from Dad a few years ago. I think Bruce will like the paring knife addition to the cook it. The very sharp blade will be perfect for cutting up potatoes, garlic, shallots, etc. I like the fact that it is bright red, it'll be easy to find in the cook kit (I plan on doing a post about the contents of the cook kit soon). And the blade cover minimizes the chance of cutting a finger while reaching it to the kit. I was remiss yesterday in my post about trip planning. I forgot to mention that a crucial part of it all is running it by my sailing partner Bruce and getting his input. He has had a lot of great input over the years. He'll talk mostly about menus, but he has also changed the way I think about gear, the mental aspect of going on a trip and he has also suggested some changes in our routes. Since I live on the east coast I'm more familiar with the territory and I'll research a trip and then pass on a suggested plan to Bruce. He'll look it over and give me his reaction. Then we finalize it together via phone, email or skype. This photo was just before we cast off on the 07 Cedar Island trip, leaving out of Harker's Island Fishing Center. It has rained heavily the day before as we drove down. It rained all that morning. As we put the boat in the water thunderstorms were rumbling off to the east. A local sailor came by and said "You're not going out in that, are you?". Bruce looked at him, smiled and said "Why do you think I'm wearing red pants?" I got my free NCwaterways maps in the mail today. I order a batch of three maps every couple of years and use them to help rough out trips. They are great fold out maps with basic navigation information (and a warning not to use for navigation), bridge and ferry information and a lot of other great stuff. It it costs nothing more than the minute it takes to fill out the online order form. I'll keep a copy to make notes on, another one I'll send to Bruce and the third copy I'll send to my Mom so she can track our trip this Spring. No, we won't use these maps for navigation on the trip, not so much because of the printed warning but because they are paper maps and wouldn't last long in the squalls and salt spray of a Carolina cruise. 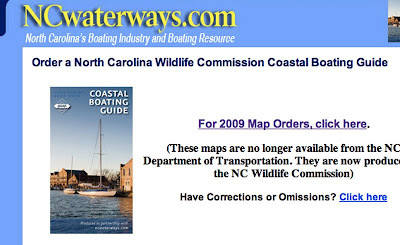 We will use a GMCO Waterproof Chartbook of North Carolina. This particular copy that we use arrived the day before our '07 Cedar Island cruise and this Spring will be the fifth cruise for the book. It is a bit worn and salt coated but it works just great. That is me below using it on the ICW during the skeeterbeater cruise. 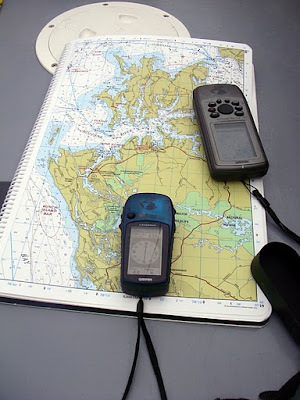 With gps devices (we carry two) and all the navigation markers do you really need a map? In my opinion....absolutely. Battery powered devices can fail, markers can be missing. The more information we have about our cruising territory the better. "Everyone has a plan 'till they get punched in the mouth." Casting off from the dock there is no guarantee on wind and weather. So we learn to adjust. But it is nice to start with a plan (and hope we don't get punched in the mouth). So here's a list of the daily mileage from point to point. 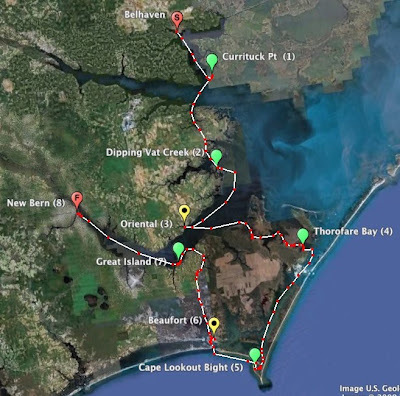 Day one from Belhaven to Currituck Point, 12 miles. 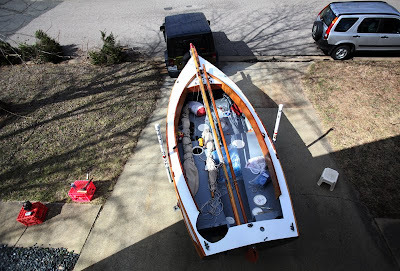 This is getaway day with final packing of the car at my house, a three hour drive, rig the boat, load the boat (that should have us ready to cast off about 11 a.m.). 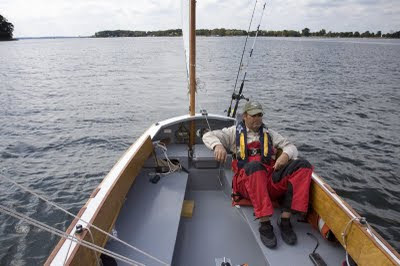 I like to start out with a short sail, make sure the boat/gear is in good shape, get anchored in time for a nice dinner. 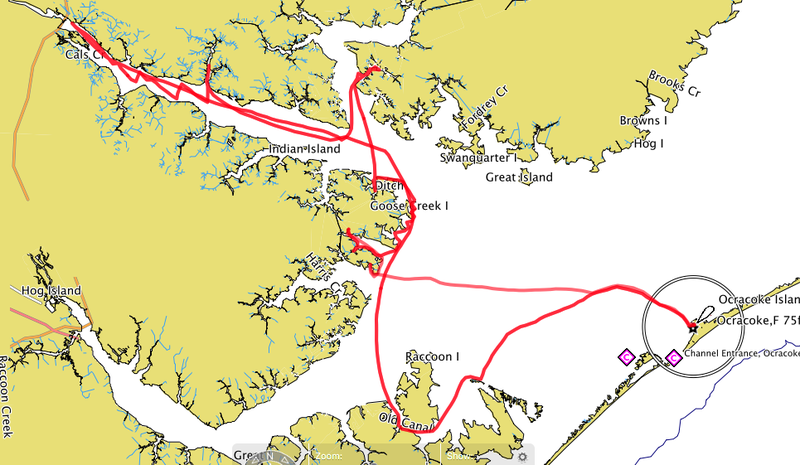 I'm also looking at an alternate plan of Rose Bay Marine to James Creek (below) on the south side of the Pamlico River, that has about the same mileage. 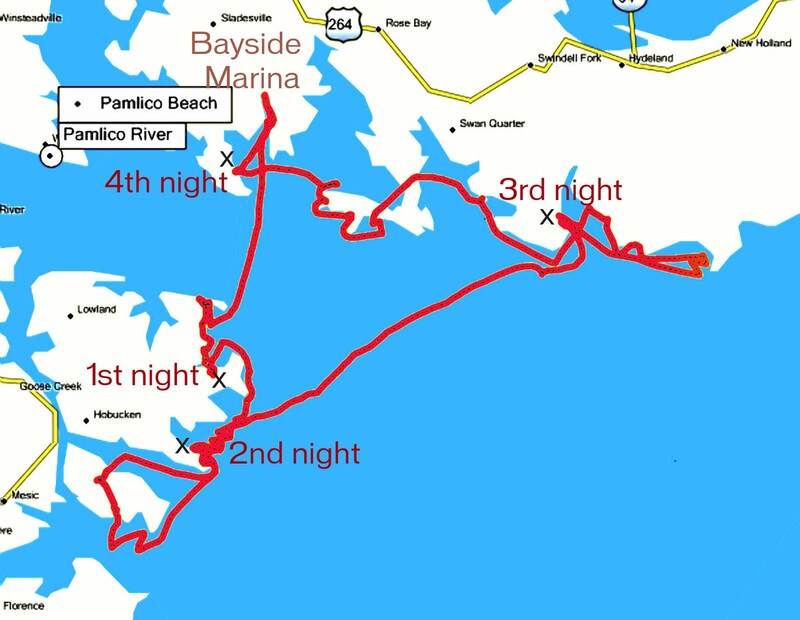 Day two from either Currituck Point or James Creek to Vandemere and then Ball Creek, 26 miles. 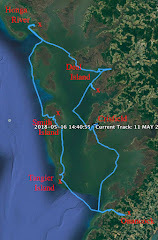 Day three from Ball Creek to Oriental, 24 miles. 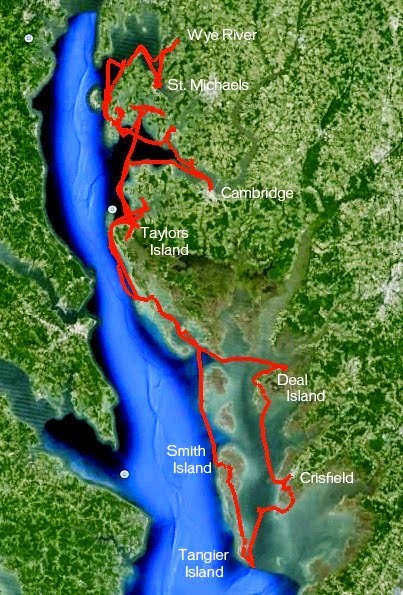 Day four from Oriental to Thorofare Bay, 26 miles. 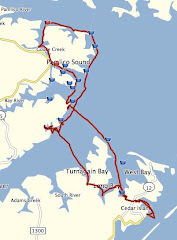 Day five Thorofare Bay to Cape Lookout Bight, 27 miles. 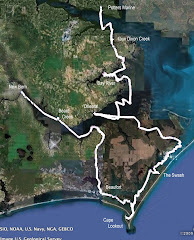 Day six Cape Lookout Bight to Beaufort, 13 miles. 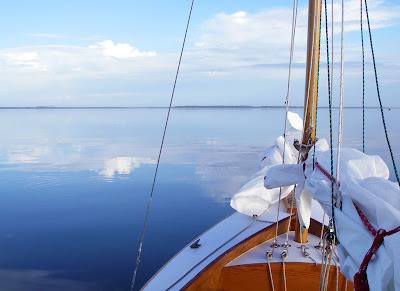 This would be a sail out on the ocean (Onslow Bay). Hopefully we would be in Beaufort by early afternoon as that is a great town to visit. 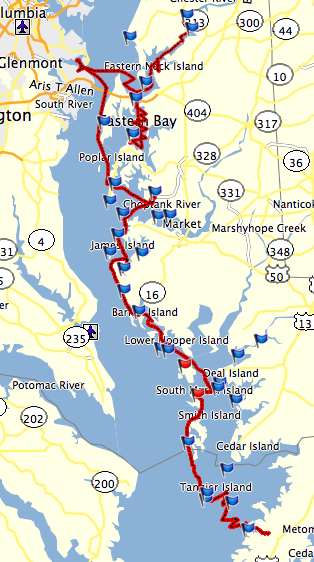 Day seven Beaufort to Great Island (the one on the Neuse River), 24 miles. Or possibly to Beard Creek, 31 miles). Day eight Great Island to New Bern, 22 miles (or Beard Creek to New Bern, 13 miles). These aren't record setting distances. Sure, we could do more. But distance isn't our goal. 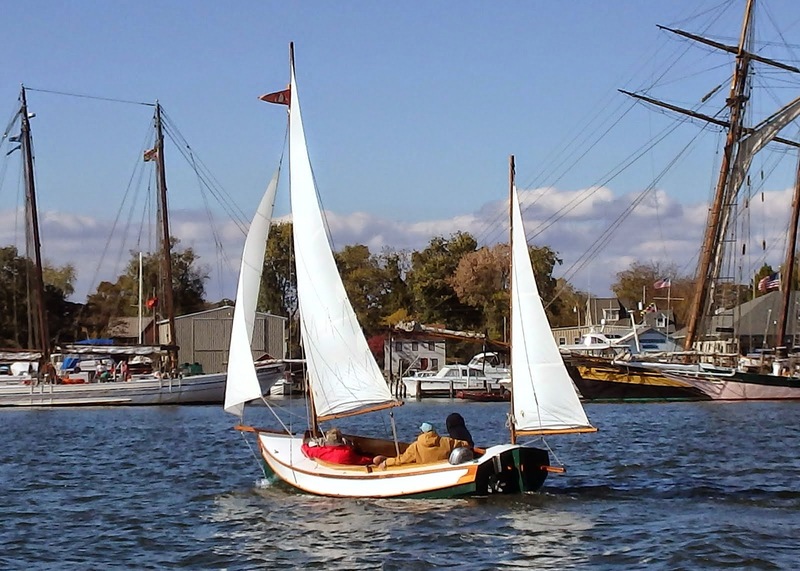 We are out there to have fun, enjoy life, sail, have a good conversation. And we're pretty content if we are anchored by 4 pm with plenty of time to clean up the boat, fish, read and get ready for supper. The distances are all direct line measurements. Who knows how far the actual mileage will be? It all depends on the wind. 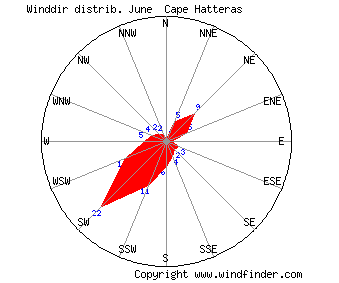 Above is the wind compass for June in our sailing area. It shows wind out of the southwest. But last year, late May to early June, we had wind out of the east for much of the trip. 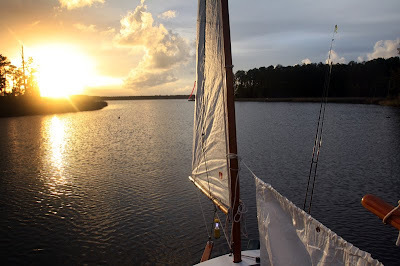 Below is our sail down the Pamlico River. 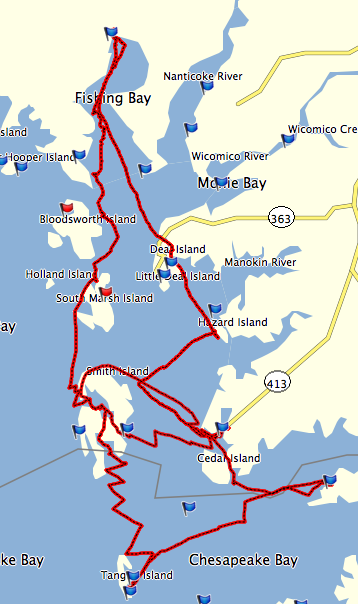 With strong wind out of the east a 13 miles trip turned in a a 30+ mile sail. It is fun to look at the charts and make plans. We'll have to wait and see if we get punched in the mouth. swears he will always take a chance. 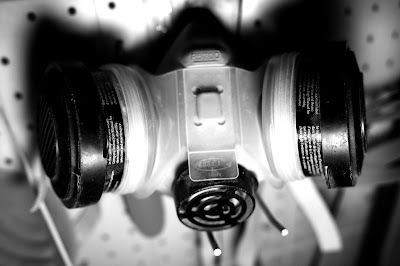 Maybe I need better ventilation in the garage. We had a nice winter day with lots of sun and temps in the mid-50's. 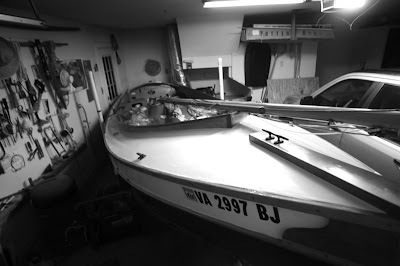 I rolled the boat out of the garage and spent the day cleaning, sanding and painting. 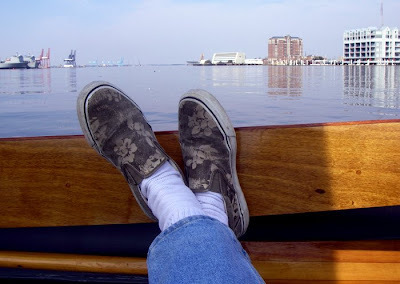 It felt good to sit inside the boat and feel the warmth of the sun (even if it was just parked on a street). The painting is all touch up work. Some sea green for the hull and rudder. Glossy white for the decks. Battleship grey for work on the cb trunk. And varnish for the rub rails and coaming. The boat has taken a beating over four seasons of use. That's fine, I don't mind the wear and tear if I am having fun. Warm temperatures should continue for the next three days of my long weekend so I should get a lot more work done and be ready to go by March. That is just one of the tips I have picked up from the Watertribe website. 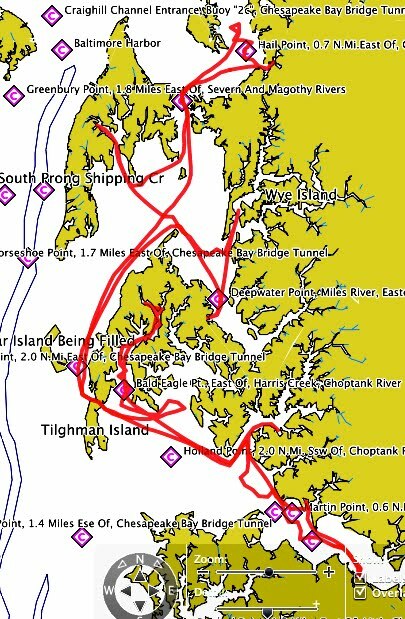 I have found a lot of sources of good information about small boat cruising over the years but the best by far is the Watertribe site. I visit it all year long but I study it closely three times a year - before the spring cruise, before the fall cruise and right now just before the start of the Everglades Challenge. There are a lot of good questions and great responses from some very experienced people. I can't begin to count the number of ideas I've picked up over the past few years from the forum. There is also an excellent magazine site on the Watertribe page. 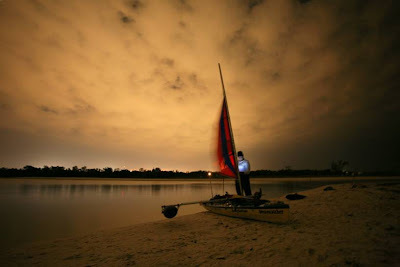 Here are some of the articles that I consider a must read before going on a small boat journey. I should note that all of the articles listed above were written by Steve Isaacs (aka "Chief" on the Watertribe site). I've never met him, probably never will, but I cannot thank him enough for all of this great information. In addition several competitors have articles describing their race adventures. Reading these stories will give anyone making small boat journeys something to think about. As with any race you have got to have your favorites. For the past few years I've followed Kiwibird and SandyBottom. I came across their blogs a few years ago (this was how I heard about the EC) as they trained together and I have followed them ever since. (SandyBottom will notice that I have stolen many of these photographs from her blog (hope that is ok!)). I did get to meet SandyBottom and her husband DanceswithSandyBottom (there is some imagery for you) a few months ago, and I hope someday to meet Kiwibird. I will be pulling for them all during this year's race. Note the interesting names. Each competitor has a tribal name, sometimes descriptive, sometimes entertaining. Take a look at their Rogues Gallery to see some of the tribe. 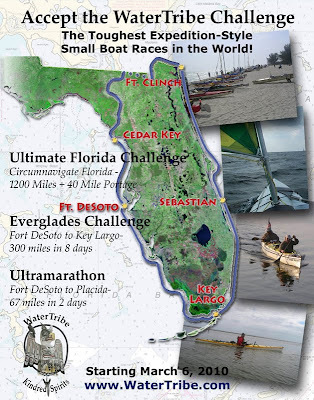 Now I do not expect I'll ever compete in an Everglades Challenge. Somehow I don't see my favorite techniques of "anchoring in a cove reading a book/drifting along a marsh casting a lure/taking a nice afternoon nap" as good race strategies. But I have learned to never say never. And if I do compete I want to have a good name. With that in mind I reserved the name "Skeeterbeater". We'll see if I ever use it. 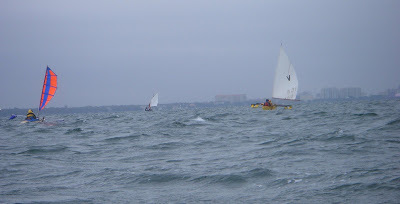 So while the EC crowd is gearing up for their race I am getting ready for sailing season. 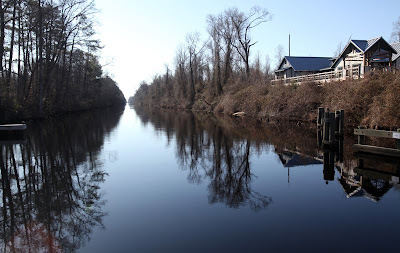 I had to run down to North Carolina (just 15 miles from my house) for work today and stopped along the Dismal Swamp Canal (above) to enjoy the warm sunshine. I've got four days off starting Sunday and the good weather should hold. The only thing on my schedule for the long weekend will be getting Spartina ready for a an early March launch. I can't wait! With a day off and temperature soaring to the high 40's I got a little boat work done today. Did some epoxy work on the tiller and put some paint on the cheek block spacer (the cheek block is to hold the center board pendant). 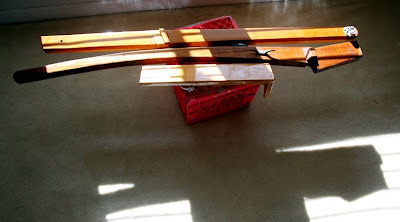 Also expoxied the drain hole I drilled under the mizzen mast step. 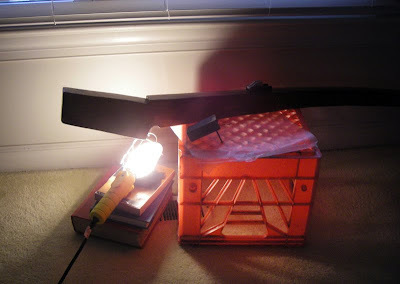 While it was a relatively warm day I used the heat from a light bulb to speed up the curing process on the epoxy. 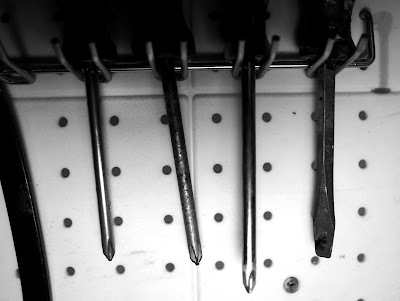 The faster the epoxy cures, I've found, the easier it is to work with. Had some time and birthday money from the girls yesterday and went to the Bass Pro Shop across the river in Hampton. Got a nice inshore salt water fishing rod - an ugly stik - and a sunblock shirt for sailing. I'm about all set on clothes now - two pairs of pants nylon pants with zip off legs, a pair of shorts and four or five nylon sunblock shirts. That should be plenty. If anything, Bruce and I have talked about carrying less on the next cruise. A couple pair of pants and a few shirts should do it. The fishing rod is really light weight, probably the nicest one I've ever bought. Should be perfect for trout and puppy drum. 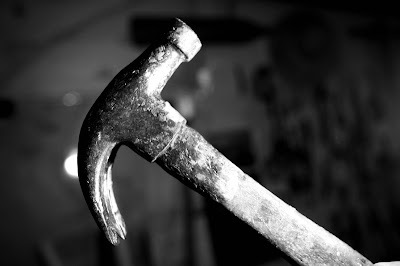 The rod is guaranteed not to break. But no guarantees on catching fish. The wind had dropped off considerably so we had a very relaxing sail. For the first time on the cruise we had time to talk and share our thoughts from the past week. The sun was warm and it was a great afternoon. He was exactly right. We had our hands full with small craft warnings, strong winds and waves for the first several days of the trip. It was nice that day just to relax and catch up. The SkeeterBeater trip had more calm days (with a few pretty good squalls mixed in) and we spent a lot more time kicking back and visiting about friends, family, work and just about everything else. We've had long discussions about camping, sailing, religion and even (watch out!) politics. 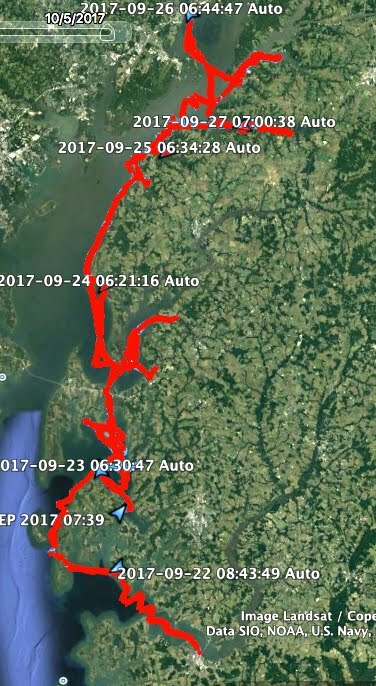 Each of the three trips we have done have had their own character, each with a different rhythm and feel for wind, weather and sailing. I wonder what the next trip will be like. 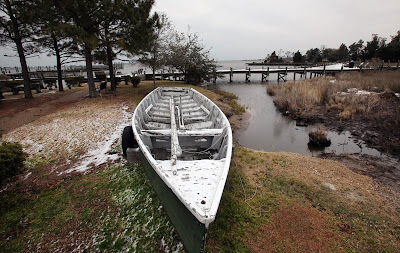 I went to the Outer Banks looking for the snow storm but didn't find it. Just a light dusting of snow and some cold wind. 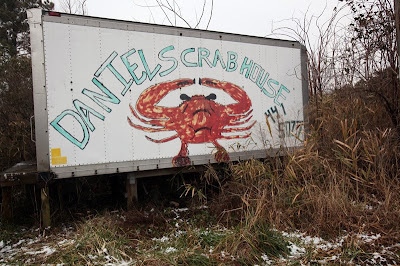 So I drove over to Roanoke Island and visited some of my favorite spots. I used to spend a lot of time down there in the late '80's, before kids, before responsibilities when I could grab the fishing rod and head to the Outer Banks and relax. 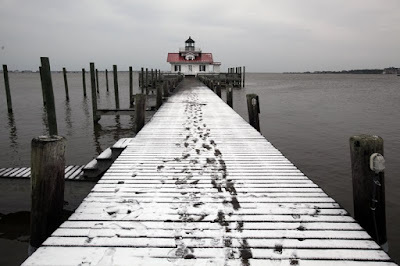 The snow did show up further south in Oriental, check out TownDock's pages of snow photos. Temperatures are forecast for the low 40's so maybe it will be in the 50's in my garage and I'll get some boatwork done this weekend. 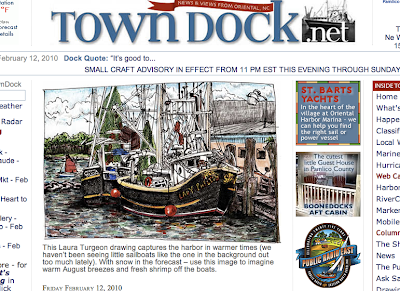 TownDock, the online news site in Oriental ran a great drawing by Laura Turgeon to help residents imagine August weather when in fact the forecast has a 90% chance of snow tonight and tomorrow. I've got to say I'm a fan of Oriental, TownDock and Laura Turgeon. I've never met Laura (hope to someday) but Bruce and I did meet her husband Gilbert on our last sail through Oriental. He invited us over to their studio where we saw some great work by both artists. I do wish TownDock would update Laura's Drawing the Town feature on their page. But even if they don't you can still see more of her work at her own site. And more weather. 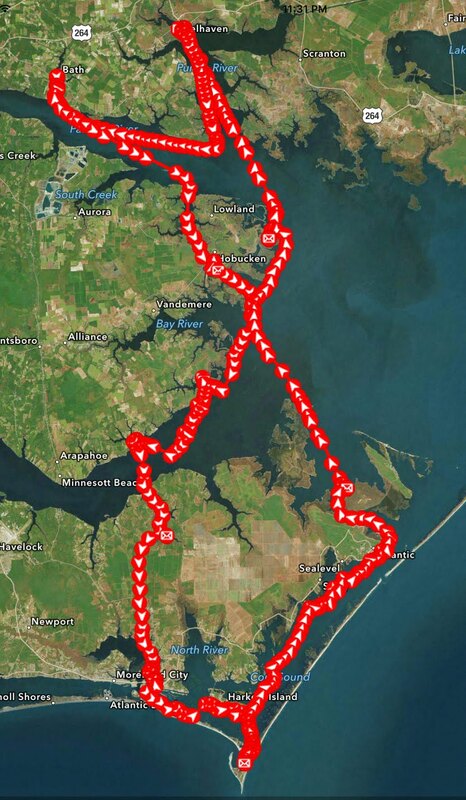 I was looking at Perry Burton's Coastal Cruising in a Pathfinder blog. 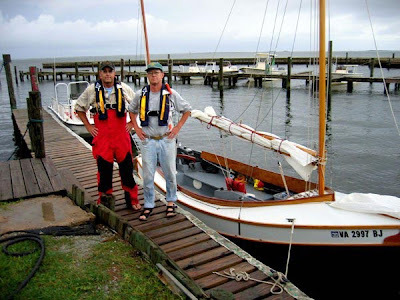 Perry built the sloop rigged Pathfinder "Pikake" (a really beautiful boat) up in Newfoundland, Canada. 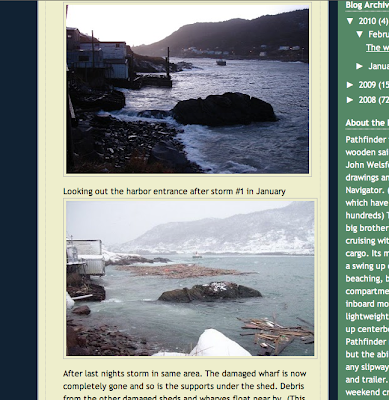 He has an interesting post about a winter storm that damaged some of the old waterfront buildings that housed fishing gear stored by generations of fisherman. This will be a winter to remember for a lot of us on the east coast. We've got the storm coming in tonight (I hope to sneak down to the Outer Banks to see what it is like down there) and another coming in on Monday. So when does winter end? I finally got the usb to serial port adapter so I could connect my Etrex Legend gps to my new (really my daughter's old) laptop. 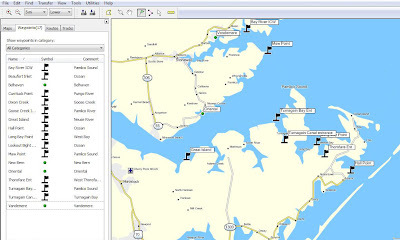 The tech's at Garmin were very helpful in getting me the upgrades to the Mapsource software to make it all work. 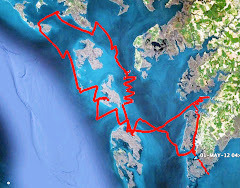 Once it was all connected I started roughing out waypoints for the trip. These are approximate waypoints, later I'll go back and with Google Earth make them more precise. But I just wanted to look at the number of places I would like to mark. Once they are fine-tuned I'll export them to both my old gps and Bruce's newer, much better model. We use both gps's on our trips. 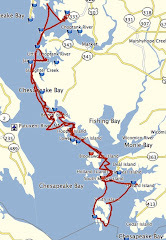 There they are set out on the Chesapeake Bay map book during the cruise last fall. 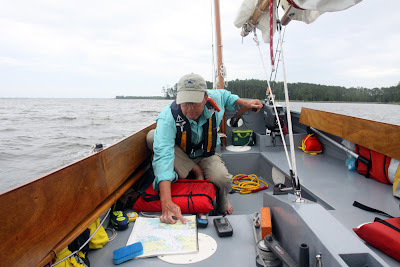 We use my older gps as a compass while Bruce's had imported charts with depth contours and navigation marks. 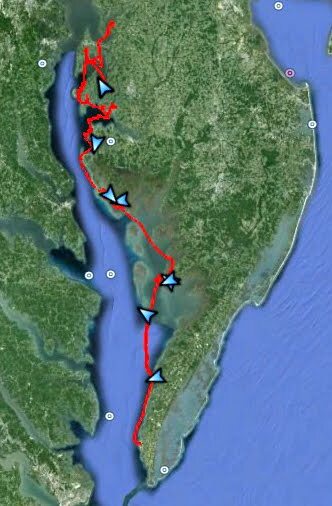 When I booted up the Etrex it showed the waypoints from the Chesapeake Bay trip and also the trip computer totals for that adventure. The fall trip was just five months ago, but it seems like it was years ago. Four months until the next trip (and sure, I could have waited weeks and weeks before I really needed to mark my waypoints but it seemed like a fun thing to do on a cold winter night). Quiet day at the office so I did a little tide research for the Spring trip. 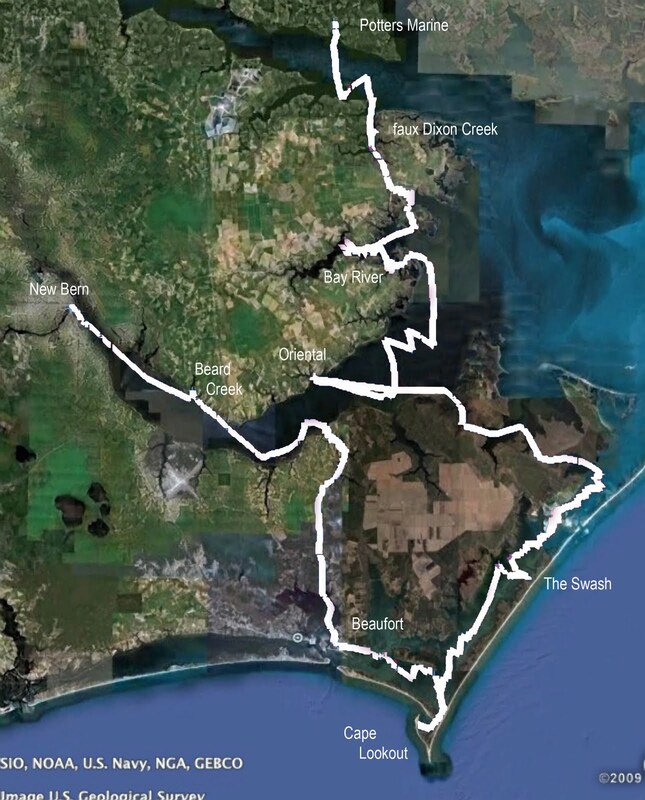 One of the legs we are looking at is from Cape Lookout Bight to Beaufort Inlet on Onslow Bay (which is part of the Atlantic Ocean south of Shackleford Banks and inside of the cape). It is, depending on wind and wave direction, protected water but at the same time it is the ocean and I would be thrilled to sail on the ocean. 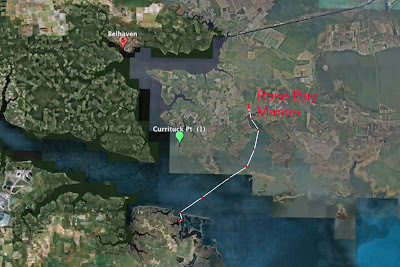 The tides would be important both exiting Cape Lookout Bight and certainly entering Beaufort Inlet. And the tide tables show that the water would be moving in our favor. 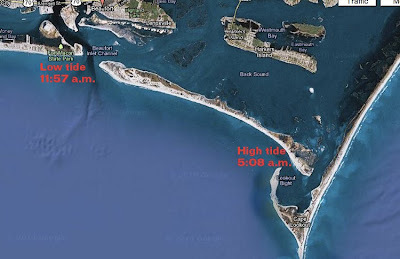 With a high tide at 5:08 a.m. at the Bight we would leave there on an outgoing tide. We would have a few hours to enjoy the ocean (trolling, anyone?) 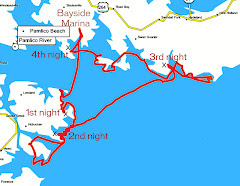 before heading in to Beaufort Inlet after the 11:57 low tide, coming in on the slack tide or a while later sailing in with the incoming tide. That all depends on winds and waves of course. 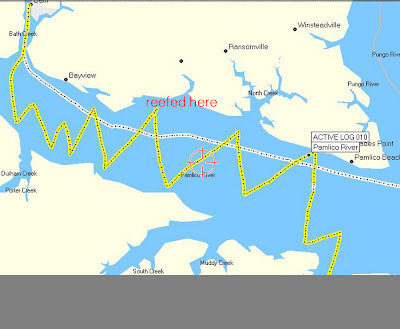 If the ocean is too rough we can get from the bight to Beaufort on protected water inside of Shackleford Banks. 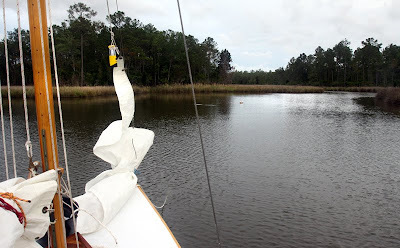 That's Bruce with Spartina above in '07 on our first sail down there just inside of the Inlet. I think that is the eastern end of Bogue Bank out past the boat. We had just come down from Oriental using the Adams Canal and then explored a bit before tying up in Beaufort for the night. And looking at the charts reminded me of all the places we visited down there. I haven't seen most of those places in almost three years and look forward to getting back there. Above is the Swash, a nice protected area on Core Sound south of Drum Inlet. We should pass by there, but probably won't anchor there on this upcoming trip. Core Sound is a beautiful place with very little development along shore, just a couple little fishing villages. 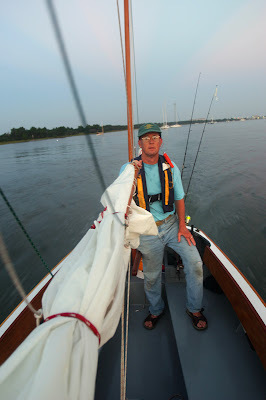 And Bruce shot this photo of me going down Taylor Creek near Beaufort before dawn. That was my second cruise on Spartina and Bruce's first. You can tell I had a lot to learn, wearing jeans and a cotton tee-shirt. (As the ad for high tech clothing says "Cotton is the enemy.") Bruce set me on the right track that trip with good advice on clothing. Now I stay much drier and much more comfortable. And this was also the last trip we made before discovering the secret for true happiness in life.........Bivy Sacs. It was a Super Sunday yesterday. Enjoyed the win by the Saints and also got some work done. I hit some of my favorite expedition suppliers (Walmart and the local grocery store) to pick up some canned/boxed food for the spring trip(s). 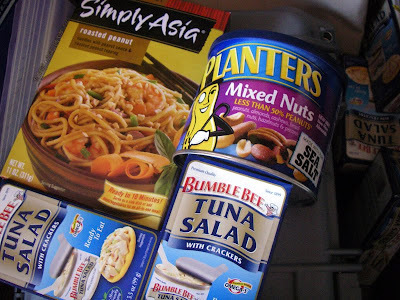 Walmart had the tuna salad lunch packs - can of tuna salad, crackers and a little spoon - for about 35% less than the grocery store. Add a cup of fruit to that and the tuna salad pack and it is a great lunch. Cheap, simple and good, these are pretty much the standard lunches on our cruises. Also got some Simply Asia meals which include noodles, sauce and something to sprinkle on the meal (sesame seeds, peanuts, etc). Add meat - fish, canned meat or the defrosted pork/steak/chicken and you've got a great, very filling and very good tasting dinner in about 15 minutes. With the superbowl the mixed nuts were half off, bought a couple of cans that I'll add to dried fruits for a nice trail mix (I think it is cheaper to make my own, plus I put exactly what I want in there). Also did some work on the cheek block spacer that I'll add to the cb trunk, made some new reefing lines and cut some line for sail ties to replace a few that are starting to fray. 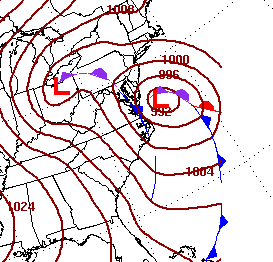 We've got another storm on the way, should be here Wednesday (that is the forecast map below). This seems to be the stormiest late fall/winter I can remember in the 20 years I've been here. It all seemed to start with the Friday the 13th nor'easter in November. Every week or two we get another storm. We had the wind, snow and rain this past weekend, plus the record setting snow the weekend before. Hope it ends soon. 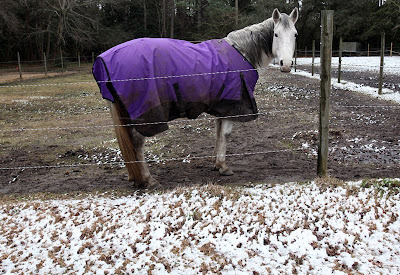 I've got to end this post with this photo that I stole (hope that is ok) from SandyBottom's blog, she was out training in the cold weather over the weekend. I really like the light, the muted colors and the graphic composition. I spent a long time looking at it when I first saw it yesterday. 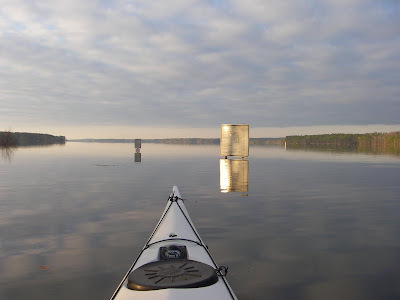 A nice reminder that you can see and experience some really beautiful scenes when you get out on the water. Thanks for the great image Dawn. Those are the pilings at a ramp I sometimes use on the southern branch of the Elizabeth River. The strong winds out of the northeast have pushed water from the Chesapeake Bay up the James River into the Elizabeth River bringing much higher than normal tides. The pier itself is about a foot underwater. But I like the way the snow looks on the pilings. 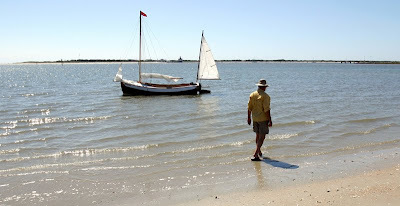 Standing there is was hard for me to imagine that in early March of last year I was launching Spartina for the first sail of the year and it was 70 degrees. Okay, so there wasn't much wind that day. I didn't hear anybody complaining. 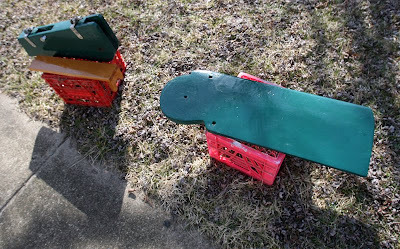 Right now I'm just hoping for a warm stretch of weather to get the painting and epoxy work done. Cold, snowy, rainy, windy day today. I read that because of the weather the mid-Atlantic "shut down." My bosses must have missed that memo, I've got to head in to work in a while. But when I get home it will be a perfect evening for reading my new book picked up off the bargain table at Barnes and Noble. It is Silver by Edward Chupack. The full name of the book gives it a bit more flavor....Silver, My Own Tale As Written by Me with A Goodly Amount of Murder. 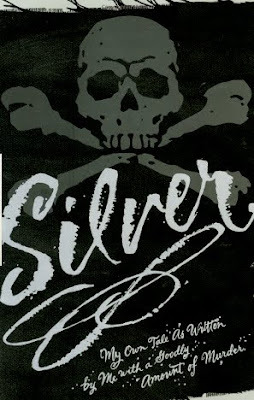 The Silver in this book is Long John Silver of Treasure Island fame. That book all started on a rainy day (a lot like today) with a map sketched out in the Scottish Highlands in 1881 when Robert Louis Stevenson was on vacation with his family. 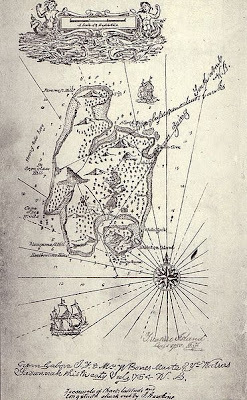 There is some debate as to who sketched the original map, either Stevenson or his young nephew, but over the next few days Stevenson wrote the first few chapters and read them aloud for his family (making changes to the story at his family's suggestions). 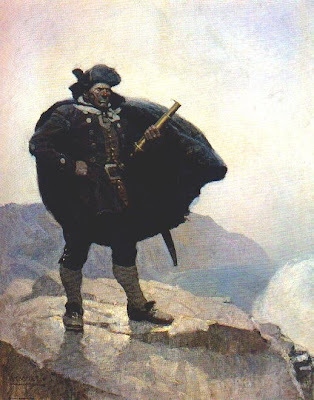 Writer Howard Chupack has created a first person confession from Long John Silver that is very entertaining. He has found a wonderful voice for the old pirate and I think I will enjoy this book quite a bit. There is another book out there based on Treasure Island, this is Dead Man's Chest: The Sequel to Treasure Island. I enjoyed reading that book a few years ago while on vacation in Ocracoke. 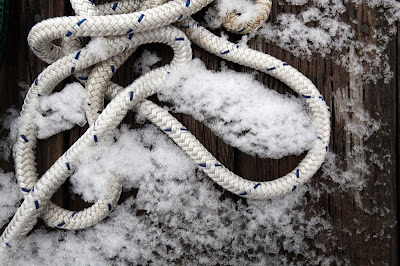 With this cold weather I'm not getting much work done on the boat. So I might as well sit back and enjoy a good read.